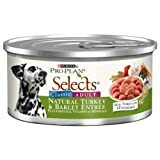 (More customer reviews)I had been feeding our newest adopted pet, a mini chocolate poodle, the chicken soup canned food since we got him last month. I felt that it was a good food, but he would not eat it unless I "doctored it up" with dry food. He wouldn't eat the dry food, Natural Balance ultra premium, alone without the canned. It got to be quite a production because there was enough in the 13 ounce size can of food for 3 days for him when I added the needed dry food. I did not like having it around that long so I decided to give Pro Plan Selects a try. When I first started mixing it with his old food, he was picking out the Pro Plan Select first. I love that this size can is perfect for his daily portion! He has had the chicken and the turkey and I don't have to add anything to it for him to lick his bowl clean. SO much easier and it has agreed with his system without complications.